Regina, SK – Through the Canadian Institutes of Health Research, the Government of Canada has awarded over $3.7 million to University of Regina researchers aimed at addressing challenges facing Indigenous youth, people living with Parkinson’s disease, and people who receive mental health care. "The work of health researchers across Canada elevates the standard of science and health care delivery from coast to coast to coast. By supporting these three teams of innovative researchers in Regina, the Government of Canada will help address the health challenges facing Indigenous youth, as well as people living with Parkinson’s disease, and mental health injuries,” said the Honourable Ginette Petitpas Taylor, Minister of Health. “We will deliver on our commitment to research today, so that our scientists will achieve health care breakthroughs tomorrow." Today, while touring facilities at the University of Regina, the Honourable Ralph Goodale, Minister of Public Safety and Emergency Preparedness, made the announcement on behalf of the Honourable Ginette Petitpas Taylor, Minister of Health. "Saskatchewan is home to some of Canada's leading health researchers,” said The Honourable Ralph Goodale, Minister of Public Safety and Emergency Preparedness. “These projects are an example of the leading-edge research being done in the province. It also highlights the strong support for research and innovation at the University of Regina." 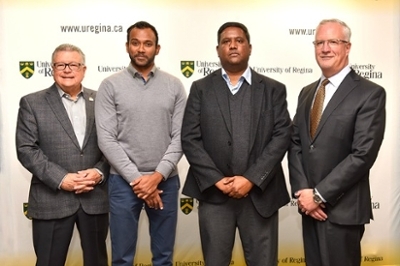 Dr. Mohan Babu, an associate professor at the University of Regina, will use his $1.9M grant to shed light on the genes linked to Parkinson’s disease. This work will yield new models, provide valuable data, facilitate the discovery of potential new therapeutic targets for neurodegenerative disorders, and inspire further research into novel treatments. Dr. Heather Hadjistavropoulos and her team will use internet-delivered cognitive behavioural therapy (ICBT), a relatively new approach to treatment, to increase the potential for patients to access important mental health care more conveniently online, with weekly therapist support by secure phone calls or email. Dr. Hadjistavropoulos’s work is supported by a grant of $971,000. Finally, Dr. Tarun Katapally will use his $772,000 grant to study how to adopt culturally appropriate ways to integrate physical activity into the daily lives of Indigenous youth to foster better physical, mental and emotional health. “The University of Reinga is a proud leader in health research. The almost $4 million boost from the Canadian Institutes of Health Research means our researchers can continue the critical work of making breakthrough discoveries and finding innovative solutions to some of the biggest health issues of our time in order to help create a healthier future for the people of Saskatchewan and for all Canadians,” said Malloy.